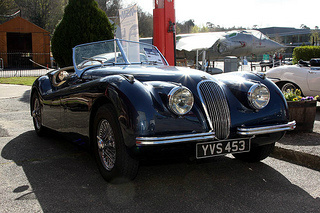 The XK100 sports car. 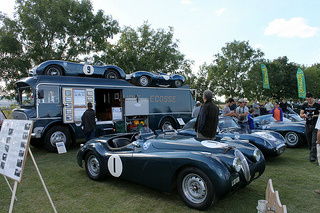 In 1948, during the development phase of the XK Jaguar engine, a small quantity of a smaller unit were built to be fitted into an alternative version of what would eventually be known as the XK120. This 4-cylinder, double overhead cam engine, with a three bearing crankshaft, had the same bore as the "120", but the stroke was shorter and so produced a unit with a 1970 cc capacity. This developed 105 bhp at 5000 rpm, and 111 ft/lbs of torque at 2500 rpm, and produced a top speed of 98 mph, and a 0-60 mph time of 15.7 secs. 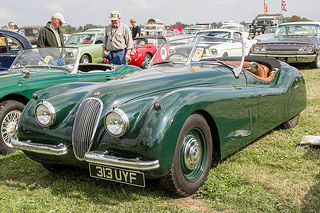 The engine was destined to be used in the XK100 Jaguar sports car, a smaller version of the "120", the only difference between the two being the engine size. It was to be marketed in the UK only. 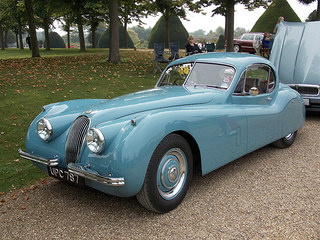 In the end, of all Jaguars cars, this one never reached the production phase since the cost of production would have been almost the same as that of the XK120. Now that the newly developed 6-cylinder, double overhead cam engine was available, all that was needed was to find an exciting outlet for it. Using a shortened version of the chassis used in the Jaguar Mark 7 saloon, together with aluminium body panels, the XK Open Two Seater Super Sports, as it was called, was introduced at the 1948 Motor Show, and marketed as a low volume speciality car. 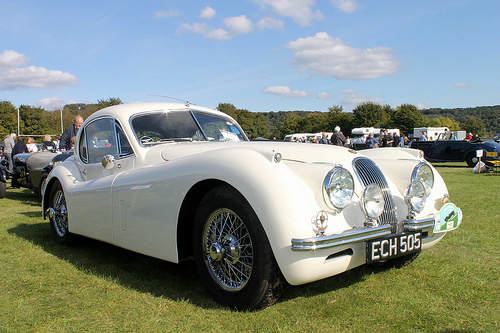 It was the first Jaguar sports car to be built since 1940. The car was a sensation, with orders overwhelming the production capabilities such that the body had to be redesigned using steel rather than aluminium panels so that it could be built on a production line. 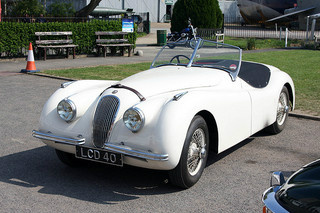 The first 239 units were hand made with wooden frames, and production did not come on stream until the convertible appeared in 1950, when it was renamed the XK120 Jaguar sports car. Since the engine was developed during the war, it was designated by the symbol "X", meaning experimental, and the 120 referred to its top speed. The fixed head coupe appeared in 1951, with the drop head variant two years later. With an aluminium cylinder head, a compression ratio of 8.1:1, and fitted with two SU carburettors, it developed 160 bhp at 5000 rpm, and produced a top speed of 120 mph, with a 0-60 mph time of 8.9 secs. 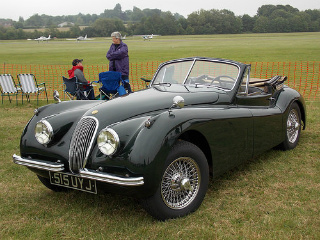 The XK120SE variant was fitted with high lift camshafts, and developed 180 bhp at 5000 rpm, with a top speed of 123 mph, and a 0-60 mph time of 8.1 secs. Standard equipment included wire wheels, overdrive, stiffer suspension, and a dual exhaust system. 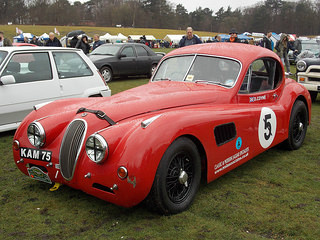 A more powerful version of the XK120SE was fitted with the cylinder head from the "C-Type", together with larger 2 inch SU carburettors, and developed 210 bhp at 5000 rpm, with a top speed of 144 mph, and a 0-60 mph time of 6.5 secs. In 1949, on a Belgian motorway, this Jaguar sports car reached 135 mph, fitted with an aeroscreen and tonneau cover. The convertible was successful on the track and in rallies. The XK's highly successful design saw it's capacity subsequently increase to 3.8 and 4.2 litres, and continue in production until well into the 1980's. 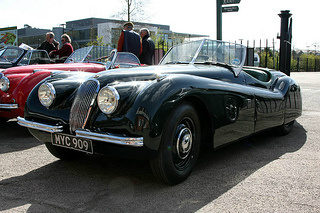 The XK120 would always be a Jaguar cars classic. A 1948-54 Jaguar XK120 would fetch in the region of £60,000/$100,000 to £75,000/$120,000, depending on good condition, whilst an outstanding example would command around £100,000/$160,000.